Fallen captivated me from the start. Hell, it pulled me in before I’d even started reading. The cover of this book is fantastic – it was what caught my eye all those years ago. I saw it and had to ask myself: who is that girl? Why is she so sad? What’s up with the creepy forest? Needless to say, I turned to the first page and was hooked. The whole concept of this novel is astounding, even now, I’ve still not read anything like it. Fallen angels, sure. But star-crossed lovers through time who have been cursed with always being separated? Millions of lives together, yet a constant fresh start every seventeen years? Damn. I probably didn’t explain it quite right, but where’s the fun in that, anyway? The whole point of reading this book is the discovery of the truth, so who am I to take that away. I love Luce. She might not be the “perfect young adult heroine,” but I still love her and am wholly invested in her story. 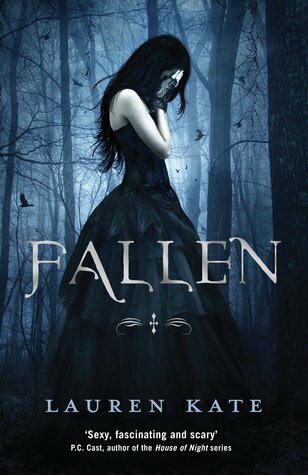 At the start of Fallen, Luce is seventeen and has just witnessed something horrible… again. Only, everyone believes she is crazy and her family carts her off to the Sword & Cross reform school. Luce is far from the craziest case there, hell, she’s so far from crazy. But, when you see shadows and think those shadows killed a person? Yeah, everyone else is going to think you’re cuckoo for cocoa puffs. Luce is a special character to me. I don’t know what it is about her, but I just sort of relate. She feels so alone in this new place, abandoned and frightened – but she’s also determined not to let that fear destroy her. She’s kind, selfless and selfish all at the same time, and she is so utterly human. She’s flawed. She makes bad choices, lets herself be blinded by circumstances, and has a few moments where she made me want to rip her hair out. She’s just like you and me, and that’s what makes this story so amazing – at least in my eyes. Of course, we can’t have a romance without the love interest/interests. One of the other things I love about Fallen is that, despite the insta-lovey vibes, it’s not easy for the characters to get together. Luce resists, they all sort of resist – except for a particular snake whom I love but still think is a giant douche canoe. Neither of the love interests, though there really isn’t much of a conflict between the two in my mind, is a good, healthy choice. Daniel is a dickwad, with a purpose of course – but a dickwad nonetheless. Cam, don’t get me started on Cam. I love him, but he’s so manipulative and horrible and emotionally abusive towards Luce. One of my favorite parts in the series (later in the series) is that moment when Luce basically tells them to shove off and takes care of herself, she’s my little badass at that moment and I love her for it. Anyways, Daniel and Cam. I obviously prefer one over the other, though I’ll always have a little soft spot for the horribleness of Cam because he wasn’t always horrible and it’s sad. One thing I will say, though, is that I love how fleshed out the characters are. The development of the story is so subtle, and the character development floats along the same sort of path. There are layers, and each time a layer is peeled away the more delicious the story becomes. Fallen has been, and probably always will be, one of my top recommendations for those wanting any sort of paranormal romance. I love this series, this book, and I always will. Luce, Daniel, Cam, Arriane, Gabbe, Roland, all of them, are special to me. You might not like these books, fine, everyone is entitled to their own opinions, but I still adore them. Give Fallen a shot, the mystery is worth it.